This provocative volume investigates the origins of contemporary African American Vernacular English (AAVE), one of the oldest, yet unsolved, questions in sociolinguistics. Shana Poplack is Professor and Canada Research Chair in Linguistics and Director of the Sociolinguistics Laboratory at the University of Ottawa. An expert in linguistic variation theory and its application to diverse areas of language contact, she has published widely on code-switching, Hispanic linguistics, Canadian French, and numerous aspects of African American English. She is editor of The English History of African American English (Blackwell 1999). Sali Tagliamonte is based at the University of Toronto. Her research focuses on morph-syntactic variation and change in the evolution of English. Currently she is investigating British dialects and conducting cross-variety comparisons amongst British and North American dialects. 2. African Americans in the Samaná Peninsula. 3. African Americans in Nova Scotia: Settlement and Data. 9. Conclusions: An Essay on the Origins and Development of African American English. "This book is a milestone in the development of the historical and evolutionary approach to linguistic analysis. I would like to think that this clear demonstration ...would close at least one chapter in the history of the creole controversies. . . Poplack and Tagliamonte have done a splendid job of bringing people back into the study of change and variation." William Labov, University of Pennsylvania. "From now on, no serious inquiry into the nature and history of African-American Vernacular English can afford not to use this book as a benchmark. At last, a thorough and closely reasoned case that despite this dialect's current status as a crucial marker of African-American identity, its main roots are in Great Britain." John McWhorter, University of California at Berkeley. 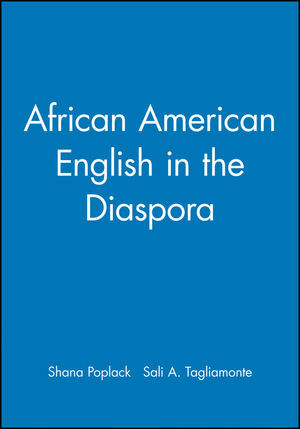 "African American English in the Diaspora is well researched, easy to read, and a significant contribution to understanding the impact of social relations on the linguistic development of African American English in the Diaspora. The original research goes beyond a linguistic study, it is a treasure for historians as well." Patrick Kakembo, Director of African Canadian Services Division, Department of Education, Nova Scotia. Situates linguistic developments regarding AAVE within a sociocultural and historical matrix. Presents details about the relationship of AAVE to various non-standard English dialects. Offers linguistic analyses of the tense/aspect systems of Samaná English & African Nova Scotian English.